Bitten by a radioactive spider, Peter Parker now patrols the streets of New York as Spider-Man! With his enhanced strength, wrist-mounted web shooters and life-saving Spider Sense, this web-head never gives up! Hey, look, it's a Spider-Man. Shocker! [No, that's later. --ed.] 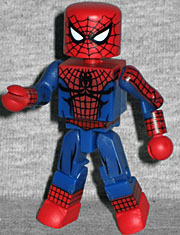 Though to be fair, this figure was released in 2009, and it was the first "plain" Spidey seen since 2003. This is just an average, red-and-blue Spider-Man, not intended to represent any specific artist or storyline. Everything is painted cleanly, though the red on his torso and arms is darker than that on his hands, legs and head. His mask is removable, showing us the smiling, clean-cut Peter Parker beneath - he's not as angry as Back in Black Spider-Man was. Since the mask fits over the head, his noggin ends up looking slightly oversized, an effect exacerbated by the fact that the white eyes of his mask are a bit smaller than they might usually be; this would have been a good opportunity for big modern eyes. Powered by his "vibro-smasher" gauntlets, Shocker has long been a thorn in Spider-Man's side. Far from a crazed supervillain, Herman Schultz continues his life as the Shocker for profit and respect - with usually unfortunate results. Shocker is such a low-tier villain that when a toyline gets around to making him, you know it's done very well for itself. And he came out in Series 24, which, as of this writing, is only the halfway point of Marvel Minimates' run! He's wearing his protective padded costume, though like ToyBiz's figure, it's the modern version: the classic one would have quilted legs, not just arms. 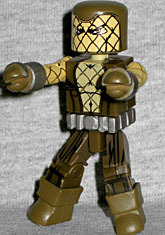 His gloves are reused from Juggernaut, and while the painted costume details are good, the yellow apps on his chest are thin and anemic, allowing the brown paint beneath to show through. That's disappointing. The figure's mask is removable. I don't know if we've ever seen Herman Schultz's face in the comics, and I'm sure as hell not about to Google "Shocker fan site" in order to find out. He looks very angry, which seems appropriate, and has heavy eyebrows and a bit of stubble. His hair is the Union Jack mold, cast in a slightly lighter brown than his costume. This isn't a wildly exciting set, but it's a nice, solid offering. You get a simple Spider-Man and one of his classic villains in one set, and sometimes that's enough to ask for. Geeks for Tots: Win Stuff and Help Kids! This entry was posted in Art Asylum, Marvel, MMMR and tagged Minimates, Spider-Man. Bookmark the permalink.